It shows whom the Kremlin considers the most pro-Russian candidate. 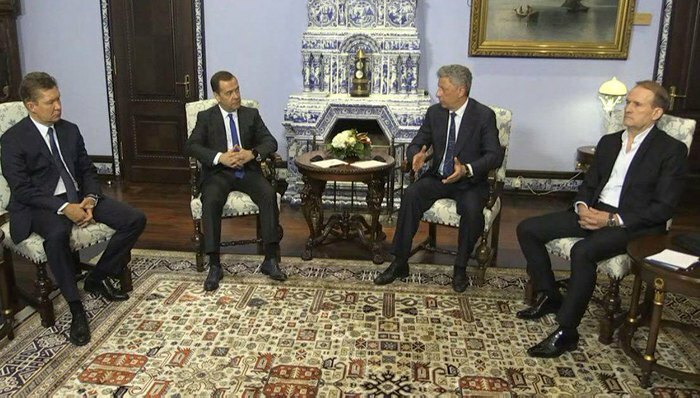 Presidential candidate Yuriy Boyko and the head of the For Life party's political council, Viktor Medvedchuk, have come to Moscow to meet Russian Prime Minister Dmitry Medvedev and Gazprom CEO Alexei Miller. Their meeting was shown live by the Ukrainian TV channels 112 Ukrayina and NewsOne. The talks were apparently initiated by the Ukrainian guests. "Indeed, in our opinion, we have an important reason to request a meeting with you because economic relations between Ukraine and Russia are extremely important to our economy. Today they are coming through perhaps the most difficult period of their history," Boyko said. In particular, they discussed the situation with the gas transit contract expiring this year and Ukrainian goods' access to the Russian market. Russian President Vladimir Putin is the godfather of Medvedchuk's daughter.